Vatti held a start meeting for implementing standard of GB/T29490-2013. The section chief of Zhongshan intellectual property office, Jiao Xuejun, the secretary general of Bureau of economic and technical information of Xiaolan, Chen Huajie, the chairman of Vatti, Pan yuanzhi, the chairman and general manager of Kechuang Patent agent co.,Ltd, Yin Wentao and XieZian, they participated in the meeting. Vatti is brand leader in Gas Stove in China, gas cookers, gas water heater and kitchen ventilator are the top three in China. Vatti was the only supplier of 2008 Beijing Olympic Games and became the manufacturer of Olympics torch. 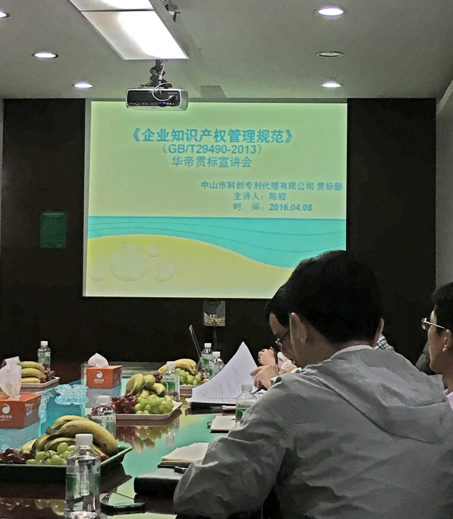 Vatti attached importance to Intellectual Property, ZhouJun, the manager of ministry of law of Vatti hosted the meeting. The chairman of Vatti, Pan Yuanzhi and the section chief of Zhongshan intellectual property office, Jiao Xuejun, both of them made a speech and expressed supports. As the counseling agency of Vatti, Zhongshan Kechuang Patent Agency Co., Ltd was appreciated by the leaders. We would devote every effort to make sure this project succeeded and improve the management work of intellectual property for Vatti.